Promised to update this and never did, so I'm adding my thoughts here. Yes.. the SS501 disbanding rumors have gotten to me, really ! it's a very disturbing thought. A notice from DSP stated that the boys are very disturbed about this rumor and the fan's reaction to the rumor. Well if the rumor is true, then they[SS501] should be expecting this....so maybe DSP is the one who's very disturbed by this rumor. About them waiting until after the new album's activities and after the CEO regains his health before deciding anything about their contract [which will expire on June7th] I have mixed feelings. On one hand I'm glad they are still together doing comeback performances for the new album [we could see them together longer ! ..imagine if they really do disband right away !! sob sob], on the other hand I feel sorry for Hun Joong who is not yet 100% recovered....but have to join these activities. Also wondering about DSP...how could they still let SS501 work for them after the contract ends....shouldn't they make a decision about the contract before that?? According to DSP this happened because the boys are respectful of the CEO, who is not yet able to handle matters of the contract due to his health...and they will wait till he gets better. We'll just have to be satisfied with this information. So, it's DESTINATION UNKNOWN for SS501 and for TripleS. 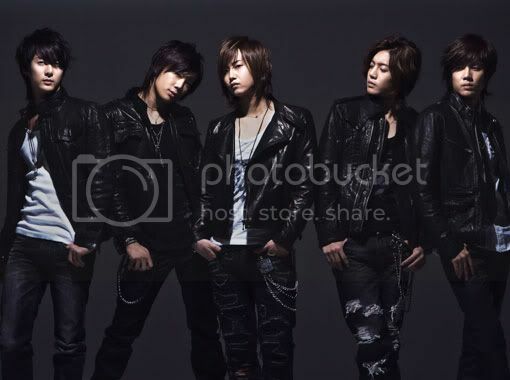 Above is the latest photos for SS501 new Album, DESTINATION. I really don't like the SM style theme for the photos [the songs, on the other hand look very promising]. But still hoping that the new album's other photo themes will be more exciting....I understand there will be more than one theme? Oh, want to talk a lot in my blog today,what with the new DSP announcement about SS501, their undecided future as a group and other matters about SS501 as members or as individuals, I find I can't stay silent and have to jump into the bandwagon and talk [yikes ! ]....but someone is waiting for me now...I'll update when I get back from work....in about 9 or 10 more hours...sob. Oh why couldn't the stylist [or the one in charge of the new album's look] had chosen some thing more like the below style??? But the make up for the MV is fantastic ! !